In my first few years of teaching, my classroom library sparkled on the day before the first day of school... every book in the proper place, facing the right direction, the corners all lined up. I'd put the last label on the last book and put my hands on my hips like a conquistador, thinking, I've done it this time. 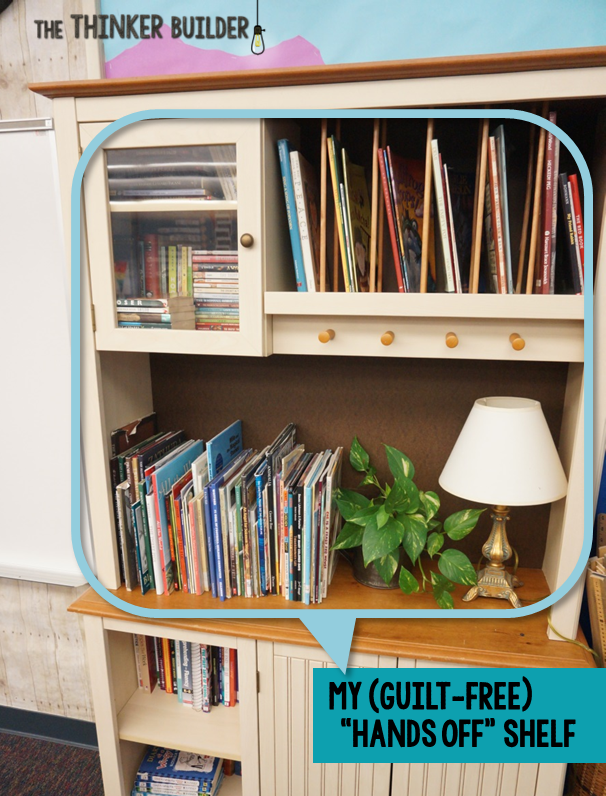 This is the year for an organized classroom library. Okay, I'm exaggerating a bit, maybe. But I'll tell 'ya what, I have gone through many "extreme makeovers" in how I organize the books (and other texts) in my classroom library. Only in the last few years have I been satisfied with my system enough to only make minor tweaks or additions. But I learned a lot in those early years about what works for my students and what works for me. 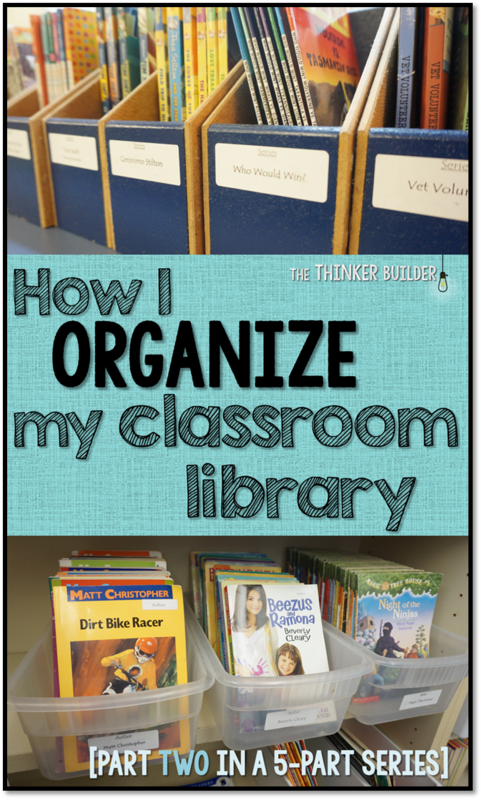 In Part One of this series of blog posts, I talked about arranging our classroom libraries, putting the pieces in place to create an inviting and purposeful area. Here in Part Two, I want to share how I organize the books within it. It needs to be easy to browse for something interesting to read. It needs to be easy to find something specific for which you are looking. It needs to be easy to return a book to the correct place. And last, and just as importantly, it needs back-up plans. In other words, it needs measures to fall back on when the first lines of "organizational" defense are broken, or ignored. With these "needs" in mind, what follows is how I go about containing books, categorizing books, labeling books, and hmmm... leveling books? I prefer to have every book in my classroom library belong to a container, as opposed to putting books directly onto bookshelves. I know what you're thinking: either, "Yes! I love containers too!" or "Hang on, isn't that an inefficient use of space?" I could definitely cram more books into a bookshelf if there weren't any buckets or tubs getting in the way, but I think the advantages to an abundance of containers outweigh the square footage they eat up. The advantages? Physical separation of your categories, and mobility! 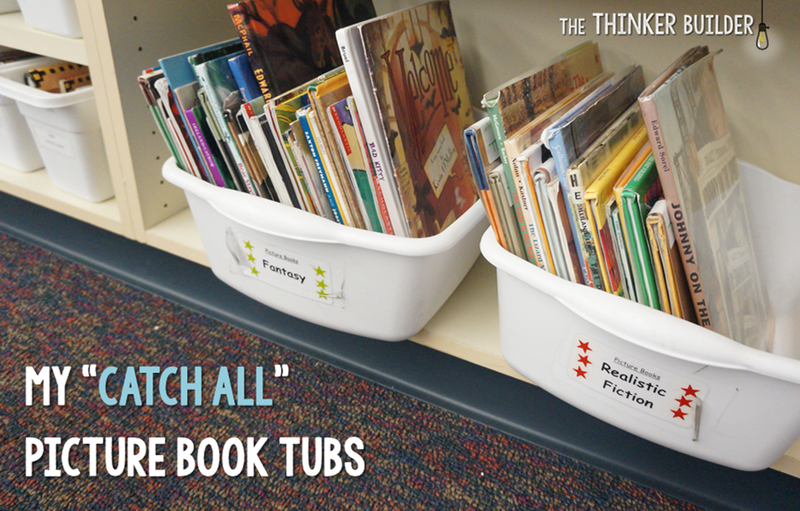 You don't have to move every single book in order to rearrange or add something; you can just move the containers around. I think it also helps students browse, because with a container, especially a smaller one, they can remove it from the shelves and browse the books within it easily, without stressing out about keeping each individual book in place. Ice Cube Bins are cheap and great for chapter books (holds about 6-10). I use them for my chapter book series categories. I also use some to hold magazines, which work 'okay,' but magazine holders work better. Makes sense, I guess. 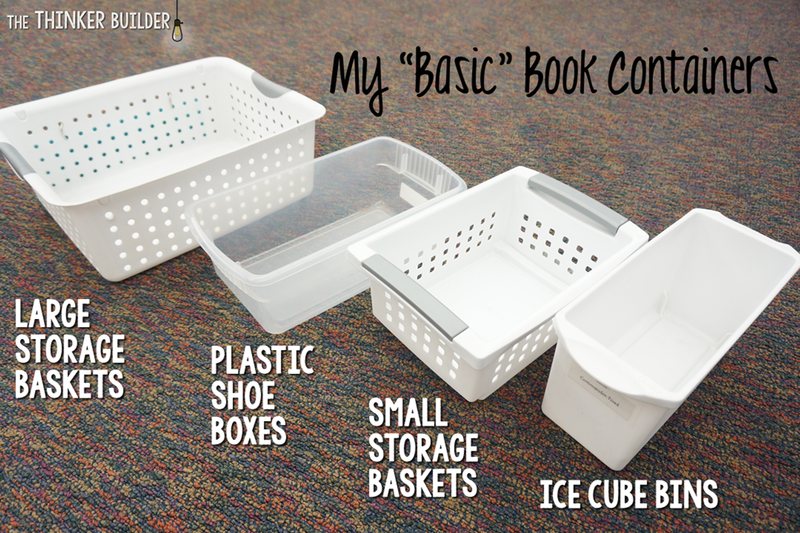 Plastic Shoe Boxes are also cheap and are great for early chapter book "readers," good for chapter books (you have to fill it pretty full for the books not to slide down), and 'okay' for picture books (they'd be better if the "walls" were taller). 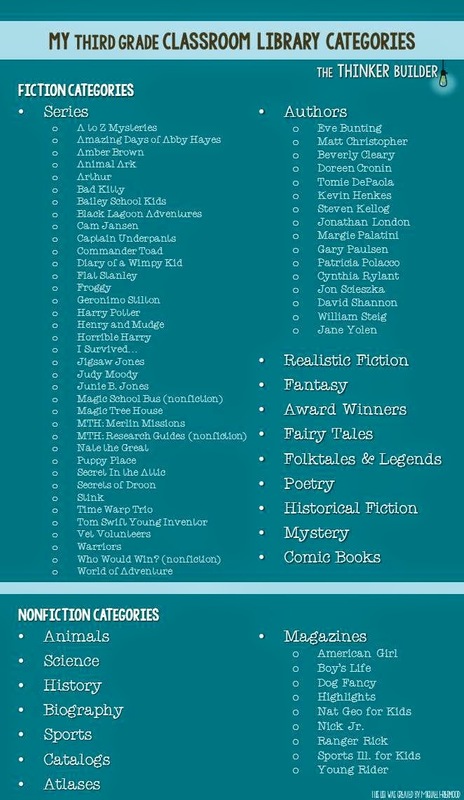 I use them for all of my nonfiction categories as well as my large-quantity series (e.g. Magic Tree House). Large Storage Baskets are a little pricey but are very durable. Great for large quantities of picture books, or any other large-size texts, like atlases, comic books, and catalogs. Small Storage Baskets are also a little pricey. Great for chapter books. I use them for my "partner books" chapter book category (more on that later). Will it fit into my bookshelves? Will it last more than one school year? I also love finding unique ways to hold books. 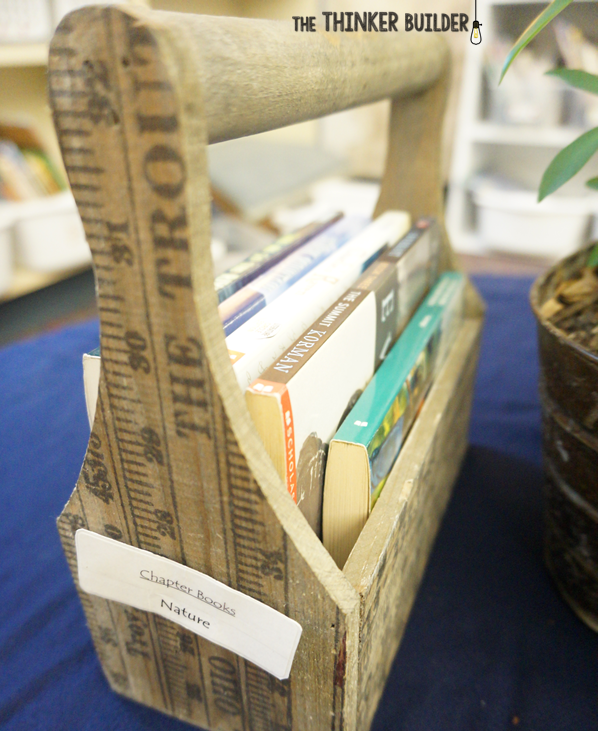 This is completely a personal-taste-thing, but I think a charming or unusual book container adds instant character to your whole library. It's like the stylish shoes you wear with blue jeans and a plain tee. Before we move on, we should probably talk about the elephant in the room, right? You've noticed all of my green and blue book boxes in my photos, and you're wondering why I haven't included those in my list of "basics," since I have like, 40 of them. Well, I built those from scratch. So yes, they are an integral part of my basic book container collection, but no, you won't find them in a store. Sorry. 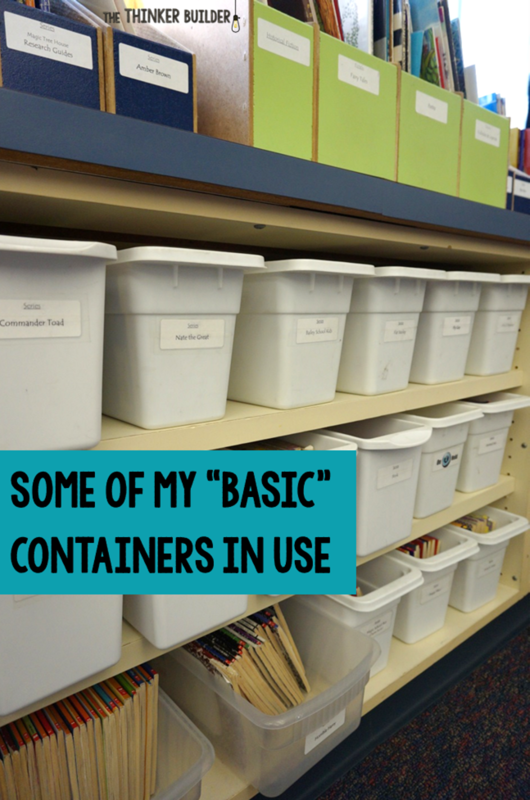 If you looked at each of my containers as a separate category, well, I have a LOT of categories. But the majority of my containers are really just a part of two categories: authors and series. For me, instead of having one basket of books by all of our favorite authors, I have a separate container for each favorite author (same thing for each series). When it comes to literature, a favorite author or a favorite series are the two most likely sources for the next book I read, so it makes sense to me to have a multitude of options for students in these two categories. What factors go into settling on a category? I try to think about: the current interests of my students, if I have enough books to even constitute a category, and a bit of "quality control," although I tend to downplay this factor when it comes to a series. Yep, I have both Captain Underpants and Diary of a Wimpy Kid categories. If you try to have a category for every single book in your entire library (and believe me, I've tried), it becomes frustrating, and expensive. It goes something like this... "Hmm, does this dinosaur book fit into my 'animals' bucket or my 'history' bucket? Ooooh, here's another dinosaur book. Well, why don't I just add a new category called, 'Dinosaurs.' Hmm, two books... welp, I better go buy some more dinosaur books to fill that bucket." So after I overcame the rage the icky feeling of not having a category for every book, I just created a few catch-all containers. I have an "Other" category in my nonfiction bookcase, a rack of random chapter books, and two general picture book tubs ("Realistic Fiction" and "Fantasy") which I guess are technically categories, but when they're that big, they are more of a catch-all. Below is a list of all my current categories, if you want to get all nitty gritty on me. You can click on the image to get a printer friendly copy. As my library grew, I fell into more and more duplicate copies of books. So I eventually created a whole separate category with these, called "Partner Books," where students will find two copies of the same book that they can read together. It is a hit! For the good of my future students, I have a shelf of books that I do not allow students to touch unless they personally ask to read a specific book. This shelf contains the books that I use in lessons or read alouds. I used to feel too guilty to do this, but it's the only way I (1) keep them all in one place, and (2) don't lose them, which would be sad for my future students. Labeling your books is highly dependent on your personality. Many teachers don't put any sort of label on their books, relying on students to return their books correctly without them. If that works for you, that is awesome. I prefer to label any book that fits into a category. While it takes some extra time, it has helped a lot with getting books back where they belong. 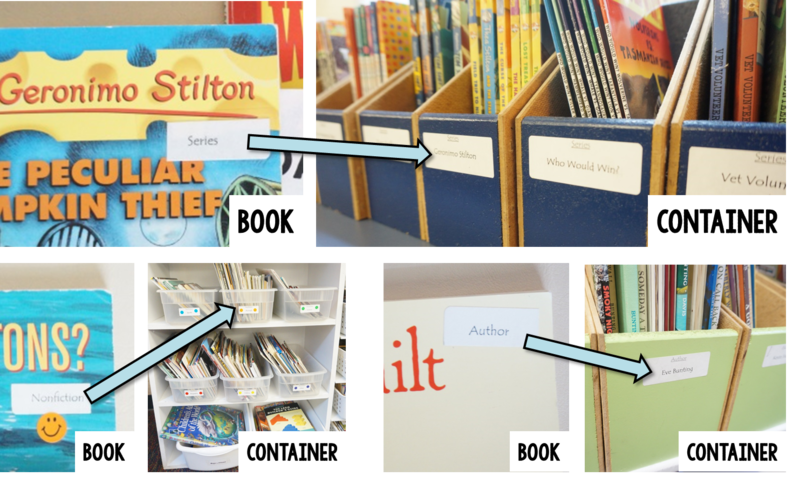 My general principle for labeling books is to make it as simple as possible for students, while keeping it simple for me. I use peel off 1" x 2 and 5/8" mailing labels for both containers and books. 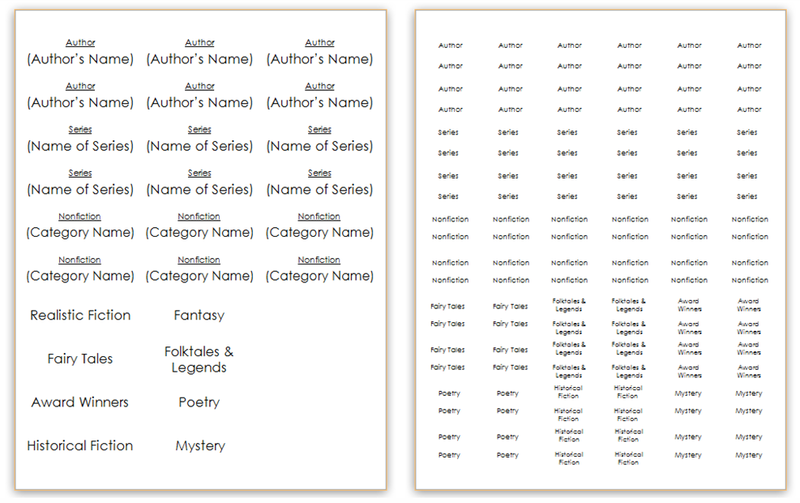 Because labels do not come cheap, I create them so I can get four book labels out of each one. 3. cover the label with a piece of standard invisible tape. For books belonging to a series category or an author category, the label only says "series" or "author," not the specific name. This GREATLY cuts down on how many types of labels I need. I rely on students' common sense to get the book to the correct author or series container. 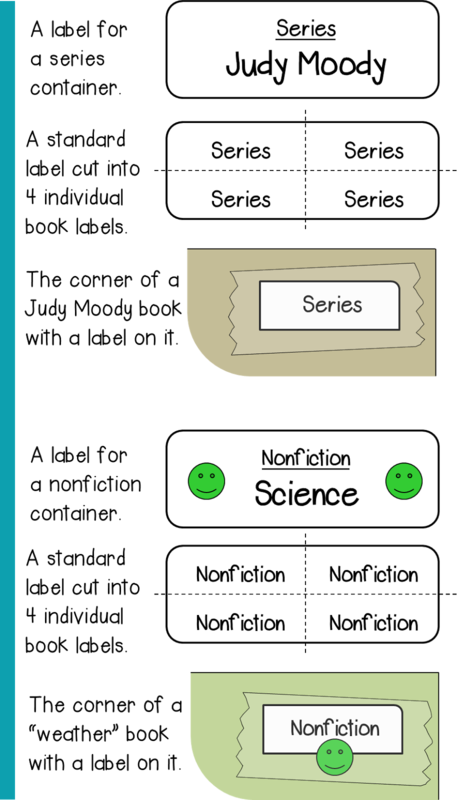 It's a similar situation for my nonfiction topics: each one has a different color of smiley-sticker, so I just add that sticker to the "nonfiction" book label. To be a little more efficient, I keep a basket in my library area with all of my labels and supplies. Now this next idea I haven't tried yet, but I think it might help the students who come to me halfway through the year who tell me they have nothing to read. It's kind of like on Amazon, where the site will suggest other products based on your shopping history. I think I'll make a few of these little signs and post them on certain book containers. Maybe I could get suggestions from students too. Don't forget to put your name in the books you own! 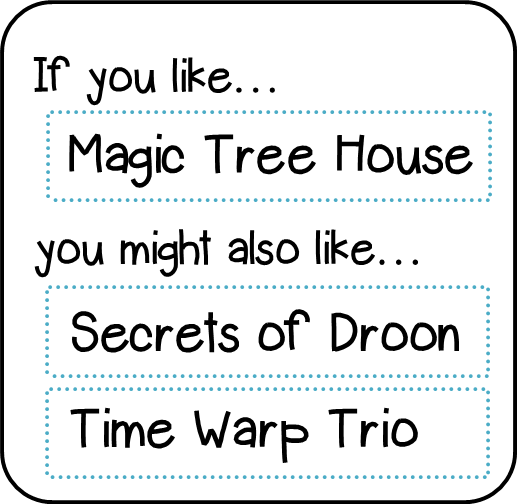 I normally just write mine inside the front cover, but you can click HERE for a "classier look" that you can print onto labels. To level or not to level, that is the question. For me, I have WAY too many other category and labeling things going on to also level all of my books. That's one reason why I don't put levels on my books. The second reason is more about life. I'm trying to build real readers by building this classroom library, and part of being a real reader is knowing how to choose a good-fit book for yourself. I did level all my chapter books during one of my very first years teaching. 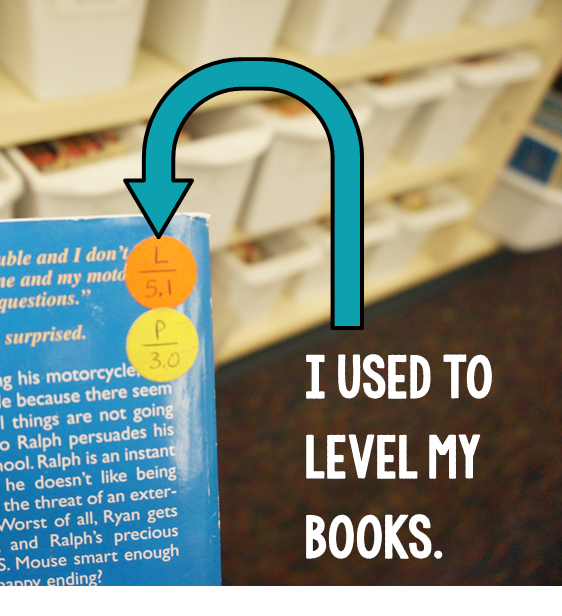 I know many, many teachers level their books, even categorizing their whole library based on books' reading levels, and run successful classroom libraries, but for me, it didn't work. I felt like it was (1) narrowing the library too much for each child, and (2) changing how students went about finding books. Instead of looking for something interesting, their first instinct became looking at the level. I just wasn't comfortable with it. There's probably a better way to incorporate a leveling system into a classroom library than how I did it, but I think I'm in too deep now without it. The key to not leveling your library is to put in the time teaching and modeling how to find good-fit books, and staying involved in the reading-life of each student. Easy? No. Rewarding? Oh yeah. Now before you go jump in the deep end and redo your whole organizational system, first take some time to evaluate what is working and what isn't working. I hope you'll take a moment to comment below about the former. And I hope some things I've shared here can help you with the latter. It doesn't really matter how many books you have in your classroom library if it's not organized well. But, I'll take a large organized library over a small organized library any day. So how does one accumulate books without emptying one's life savings? Be on the lookout for Part Three in my series, where I talk all about how I stock my classroom library.